Author Roy MurrayPosted on March 22, 2017 Categories Arts, Awards, Community groups, Culture, NewsTags 1100 Weston Road, Mount Dennis, Salvation Army, Weston Santa Claus Parade, Weston Silver Band, York Community Church6 Comments on Weston Silver Band wins big in U.S.
Rainy afternoons in October usually call for hot chocolate and Halloween movies; however, this October 1st, the Falstaff Community centre, and Urban Arts hosted a spectacular event. For almost a year, thirty dedicated youth from the York South-Weston area gathered together to create a phenomenal mural that is now covering the outer walls of the Falstaff Community Centre, located at 50 Falstaff Avenue. October 1st, 2016, was the official unveiling. Over the course of over eight months, thirty students from the area worked with Adobe Photoshop, photography, silk screening, and even got trained to use a scissor lift, all to create a masterpiece that would soon become a landmark in the area. All the students involved began their artistic journeys differently; Italia Santoyo and Dylan Kitchener, who were both involved in the mural’s creation, found out about the program from their art and photography teachers, whereas Jerlie Thorpe, who is extremely interested in the arts, was encouraged by the girl’s group club at her school. (which is also run by UrbanArts). Despite coming from different backgrounds, all the young artists were brought together by one thing: a love and passion for art. “I’m so grateful for UrbanArts. I love art and all the time people tell you that art is so hard to get into and you’re never going to get a job if you want to study anything in the arts. But Urban Arts helped me see that it doesn’t matter if people don’t believe in you. If art makes you happy, make art” –Italia Santoyo. The mural is composed of visual art, photography, silk screen and Photoshop work, all comprised into the masterpiece that is now complete. Students worked with various groups including Gallery 44, a non-profit center committed to photography, who taught them skills about their passions, which they then used to create the artwork. UrbanArts is a community group dedicated to bringing arts programs to communities in the city of Toronto. Every program run by the group involves professional artists and helps develop and engage culture into communities in need. With partners including the Ontario Arts Council, Microsoft, TELUS, UrbanArts has been making a difference in the lives of many kids since they started. With art being one of the most highly criticized and toughest paths anyone can take, many young people feel intimidated and scared about pursuing their passions. UrbanArts is changing that. From speaking to the young people involved, and seeing how passionate the program organizers were, I could tell that this project has made a difference. Being a creative person, I know how intimidating and worrisome perusing my passions can be. Seeing fellow creative people flourishing and doing something they are passionate about gave me hope. I am proud to say I live in a community that hosted such an amazing event, and I hope any aspiring artists that see all the amazing work that went into this project will be motivated to keep perusing their dreams. This post was brought to you by: Maureen Lennon, who loves Weston and great writing. Weston C.I. wins Best Buddies award. Best Buddies is a Canada-wide program that pairs up the same-aged students of differing abilities. These partnerships grow into friendships and are mutually beneficial. On Thursday, February 11, an assembly at the school demonstrated the strength and depth of those relationships. 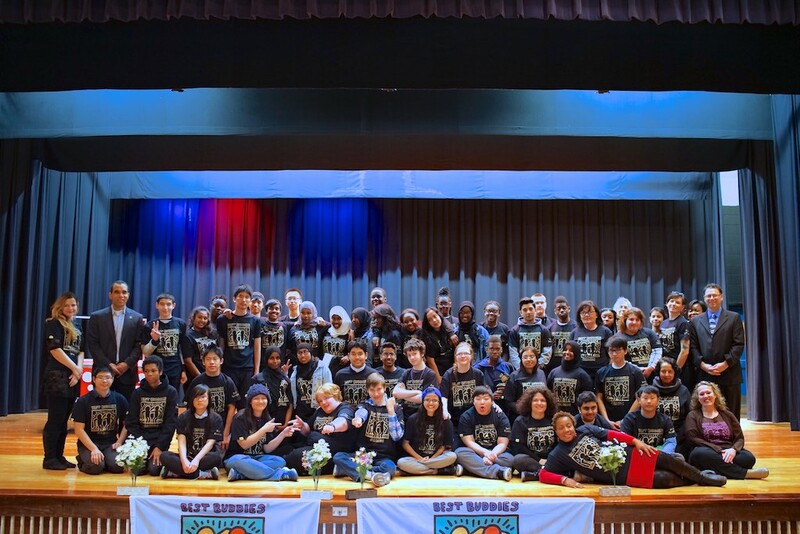 Executive Director of Best Buddies Canada, Steven Pinnock was there to honour Weston Collegiate Institute‘s successful implementation of the program over the past six years. Program buddies are paired for each school year and contact each other weekly and meet socially at least twice a month. Larger meetings of the whole chapter are held to discuss issues and to plan events. W.C.I. was also honoured for being in the top 25 programs out of 450 chapters nationwide in Canada. Youth worker, Nancy Marshall co-ordinates Best Buddies at the school and thanked the many members of staff who lend their time to supporting the program as well as events and field trips. Pinnock thanked Ms. Marshall for her leadership and the staff for their hard work in making the program run so successfully at the school. Best Buddies Special Events Director, Emily Bolyea–Kyere spoke glowingly about the outstanding work done at W.C.I. and how well the school is regarded throughout the organization. Students spoke movingly about the program and the impact it has made on their school lives; many calling the friends made through the program as close as family members. Having sat through many an assembly in a former life, I can attest to rarely being as impressed (and moved) as I was today. Well done to Ms. Marshall and participating staff and students at W.C.I. Best Buddies participants 2015-16. 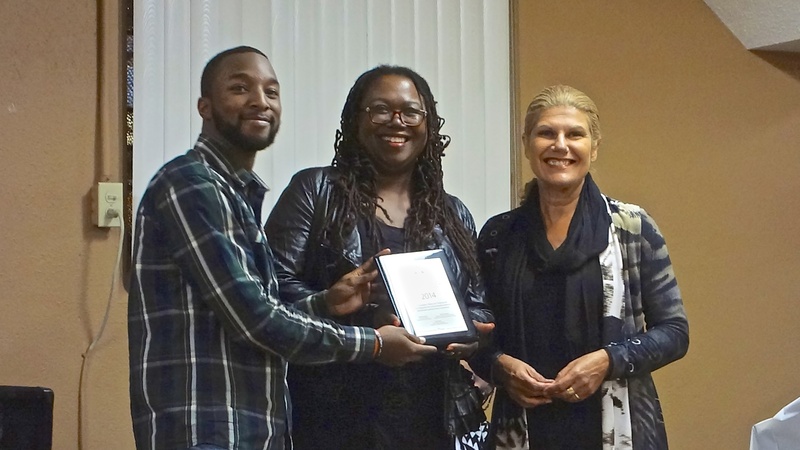 3rd from left, Executive Director Steven Pinnock. Far right, Principal Ian Botnick. Next to him, Nancy Marshall. Far right, seated Emily Bolyea-Kyere. Click to enlarge. Author Roy MurrayPosted on February 11, 2016 February 12, 2016 Categories Awards, Schools, YouthTags Best Buddies Canada, Toronto District School Board, Weston Collegiate Institute1 Comment on Weston C.I. wins Best Buddies award. Artscape will be hosting a ‘Visioning’ workshop this week. On October 15, from 7–9, at the York West Active Living Centre, they would like to know what you would like from the Artscape Weston Hub.